"What is important is that which goes on inside the Cathedral and in people's hearts when they worship there. "It will be rebuilt. Better than it was before. Better, stronger and fireproof. If people in the middle ages could build it, we surely can rebuild it!" "We know Notre Dame de Paris will be resurrected from its ashes." აბა აქ ააფეთქებდნენ, ააფეთქეს კიდეც, დედა-შვილსაც ზემოდან პრიკუპში დააყოლებდნენ, დააყოლეს კიდეც და ტაშსაც დაუკრავდნენ..
Architects and construction workers have now stabilized the damaged structure of Notre Dame cathedral, four days after a fast-spreading fire ravaged the iconic Paris building, and firefighters will leave the site Friday night, a fire brigade spokesman said. "There is no more risk the edifice's walls could fall down," Lt. Col. Gabriel Plus told The Associated Press, adding that firefighters have been able to cool down the walls and debris from the roof inside the cathedral. "It's a miracle that the cathedral is still standing, and that all the relics were saved," he said. Earlier, the cathedral's rector said a "computer glitch" may have been behind the rapidly spreading blaze that devastated the 850-year-old architectural masterpiece. Rector Patrick Chauvet did not elaborate on the exact nature of the glitch. "We may find out what happened in two or three months," he told a meeting of local business leaders. The fire burned through the network of enormous centuries-old oak beams supporting the monument's vaulted stone ceiling, dangerously weakening the building. The surrounding neighborhood was blocked off as stones continued to tumble off the sides of the cathedral after Monday evening's devastating blaze. On Thursday, Paris police investigators said they believe an electrical short-circuit most likely caused the fire. The Parisien newspaper has reported that a computer glitch might have misdirected firefighters responding to the initial fire alarm. The unsourced report said investigators are also looking into whether the fire was linked to temporary elevators being used in a renovation that was underway at the time the cathedral caught fire. Chauvet said there were fire alarms throughout the building, which he described as "well protected." Charlotte Hubert, president of a group of French architects who specialize in historic monuments, told BFM television that experts plan to spread a custom-made peaked tarpaulin across the cathedral's roof, with enough space to also shield workers rebuilding the frame. As Catholics carried out the Way of the Cross ritual near the cathedral to mark Good Friday, French President Emmanuel Macron met with officials from the United Nations' cultural agency, UNESCO. UNESCO representatives have offered their technical expertise to help with the reconstruction. Macron is moving quickly on the fire-ravaged monument's reconstruction, which is being viewed both as a push to make it part of his legacy and a way to move past the divisive yellow vest protests over social inequality in France. 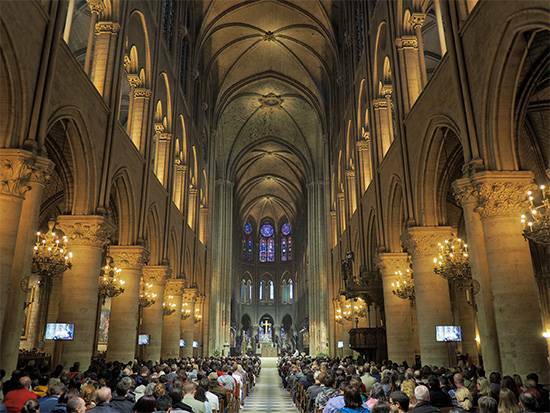 Notre Dame's reconstruction is prompting widespread debate across France, with differing views over whether it should involve new technologies and designs. Macron's office has, for example, said the president wants a "contemporary architectural gesture to be considered" for the collapsed 19th-century spire, which wasn't part of the original cathedral. Macron hasn't offered any specifics on his vision for the roof or whether the frame should be wood, metal or concrete, according to his cultural heritage envoy, Stephane Bern. He has named a general, Jean-Louis Georgelin, former chief of staff of the armed forces, to lead the reconstruction effort. Over $1 billion has already poured in from people from all walks of life around the world to restore Notre Dame. Judith Kagan, a conservation official at France's Culture Ministry, said the artworks inside Notre Dame had suffered no major damage from the fire and the pieces were being removed from the building for their protection. The Notre Dame fire delayed Macron's long-awaited plans to quell anti-government protests that have marred his presidency. The French leader abandoned a planned TV address to the nation on the evening of the fire, heading to the scene instead and declaring: "We will rebuild Notre Dame." According to an opinion poll by BVA institute published Friday — the first carried out since the fire — Macron has gained three points in popularity in the past month with an approval rating of 32%. That puts him back at the support level of September, before the yellow vest crisis, BVA said. Although all French polls show that Macron's popularity has remain depressed since a tax increase on retirees last year, they suggest his party may be ahead in France's May 26 European Parliament election, with Marine Le Pen's far-right party, the National Rally, close behind. Macron is now expected to detail his new measures next week. Macron earlier was planning to respond to demonstrators' concerns over their loss of purchasing power with tax cuts for lower-income households and measures to boost pensions and help single parents. Despite the destruction of Notre Dame dominating the news in France, a new round of yellow vest protests is planned on Saturday across the country, including in Paris. Interior minister Christophe Castaner said 60,000 police officers will be mobilized and demonstrations near Notre Dame will be banned as he expects some protests to turn violent. In a hopeful development Friday, 180,000 bees being kept in in hives on Notre Dame's lead roofing were discovered alive. "I am so relieved. I saw satellite photos that showed the three hives didn't burn. I thought they had gone with the cathedral," Nicolas Geant, the monument's beekeeper, told the AP. Geant has looked after the bees since 2013, when they were installed as part of a city-wide initiative to boost declining bee numbers. Since the insects have no lungs, Geant said the carbon dioxide in the fire's heavy smoke put the bees into a sedated state instead of killing them. He said when bees sense fire they "gorge themselves on honey" and protect their queen. He said European bees never abandon their hives. 180,000 პუთკარი, რომელიც პარიზის ღვთისმშობლის ტაძრის სახურავზე ბუდობდნენ, გადარჩენილი იპოვეს, თუ არ ვცდები თავინთ სკებში. ისე ესმით როგორც უნდათ და არა ისე როგორც წერია. ევროპელი ფუტკრები არასდროს ტოვებენ თავის სახლს! with differing views over whether it should involve new technologies and designs. იდეა,რომ შესაძლებელია ნოტრ-დამის 5 წელიწადში აღდგენა?! ეს გასაგებ მღელვარებას იწვევს იმათში,ვინც ღრმა პატივს მიაგებს ქვეყნის ისტორიას. შესაძლებელია თუ არა აღდგენა შუასაუკუნეობრივი საზომით?! რომლებმაც მთელი თავისი ცხოვრება მიუძღვნეს ამ საქმეს და არ დაუშვებენ ისტორიის თვალში მის სიკვდილს! ეს ტაძარი არის ფრანგული კოლონოალიზმის სიმბოლო. საშინელებები აკეთეს ფრანგებმა აფრიკულ ქვეყნებში. და ახლაც უხეშად ერევიან ყოფილი კოლონიების საქმეში. არ მესმის იმ ხალხის ვინც ამ შენობის ხსენებაზე სველდება..
მინიმუმ მეცხრამეტე საუკუნემდე, თითქმის ყველა შედევრი რელიგიური შინაარსისაა. სისულელეა ხელოვნების ნიმუშების იდეოლოგიური გენეზისიდან განხილვა, ვინ დააფინანსა, რატო დააფინანსა და ასე შემდეგ. შედევრი ამ ამბებზე მაღლა დგას ხოლმე. დაჟე ავტორზე მაღლა დგას, რომ არაფერი ვთქვათ ისტორიულ კონტექსტზე და იმაზე, რამდენად კაი ტიპი იყო ავტორი, ან დამფინანსებელი. ხელოვნების ნიმუში, ისეთი როგორიცაა ნოტრ დამი, თაჯ-მაჰალი. პირამიდები, ჯოკონდა და ასე შემდეგ. ესენი კაცობრიობის სიამაყეა - ყველას საკუთრება. ცოტა სადღეგრძელოსავით კი ჟღერს, მაგრამ ანბანური ჭეშმარიტებაა. ტაძრის აღსადგენად უკვე ერთ მილიარდ ევროზე მეტი თანხა გადაირიცხა. თუმცა ამასობაში ბევრი თვითმარქვია თაღლითიც გამოჩნდა, რომლებიც ვითომ ტაძრისთვის აგროვებენ ფულს.